This month I have a great tutorial to share with you from Steve Bailey of Marietta, PA. 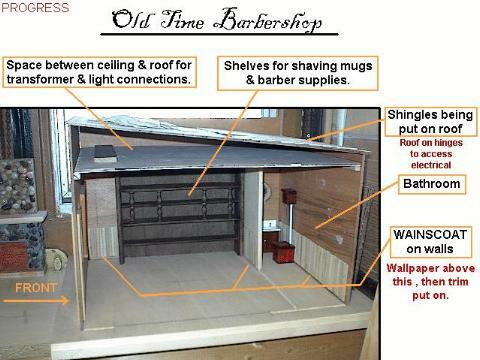 I think of him as the Norm Abram of the mini world; you know how when you watch New Yankee Workshop, Norm just makes the most complicated things look so easy? Steve's tutorials are like that! 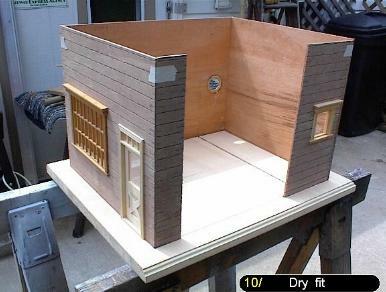 Here he shows you how to build your own custom miniature shop or house from scratch. "What I like best about doing a house from scratch is that you are not limited to style or shape of the building. You can just go crazy and let your imagination run wild and see what you come up with. I usually start with a rough drawing of what I have in mind and always change it a million times before I'm done!" Click on photos for larger view and instruction details. I usually start by making a rough pencil drawing of what I have in mind and getting the measurements so I can start cutting the wood. Remember, for 1:12 scale... 1 inch = 1 foot. If your building is 15 feet wide, that means cut the wood for the wall 15 inches. Also, remember to make your base larger that your building so you can landscape around it. 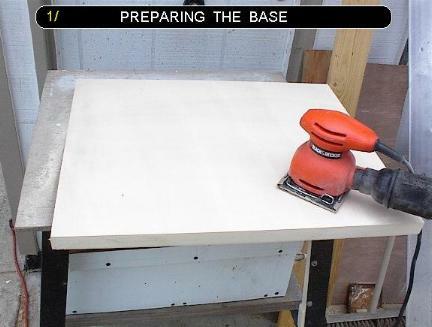 I start with the base. I like to use ½" plywood, but on this project the base is heavier because it was some material I just happened to have. Cut your base and square the edges. Sand off any sharp edges and then sand the top. Using a pencil and a square (or a combination square, ruler, tape measure, etc. 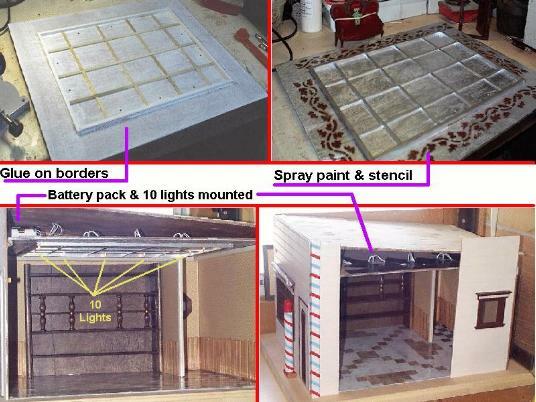 ), lay out where you want the walls to go. Using a Dremel with a #565 cutting attachment and a straight router bit, cut grooves for the walls to set in. This step may not be necessary, but I think it makes the building stronger. Here I am dry fitting the floor. For this one I used regular floor tiles that I cut into 1" squares. It's a lot easier to do it now, before you have the building together. 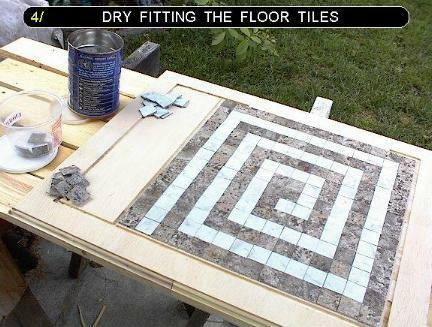 You can do the floors any way you like - tile, wood, etc. For the walls, I like to use 1/8" Luan plywood. You can get a 4x8-foot sheet at your local builder supply store for about $10-$12. I usually cut it down to about 2" larger that I need to make it easier to handle. I use my Dremel #580 table saw, with a 100-tooth blade to cut the walls. I made a small table from scraps to support the wood since it it larger that the saw top. 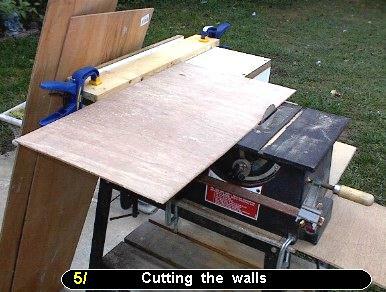 You can also use a saber saw with a hacksaw blade to cut the walls. Here I am using an edge planer to square up the walls. 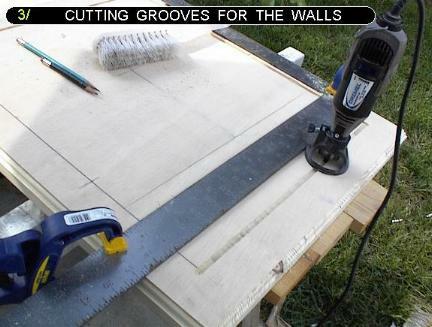 I'm sure most of you don't have one of these, so if you cut the walls fairly straight, you can use a sanding block or small wood plane to fine tune the edges. Dry fit the building again. I do this many times while I'm building a house, just to make sure I didn't goof! I wanted the look of clapboard siding, so I made a mark every 1" up the outside walls. Then with my Dremel and a V-Groove bit, I lightly cut lines across the walls. This does take some time but I think it makes a nice look to the house. After you are done, be sure to sand the walls. Now, using all my measuring tools, I marked where the windows & doors will go. 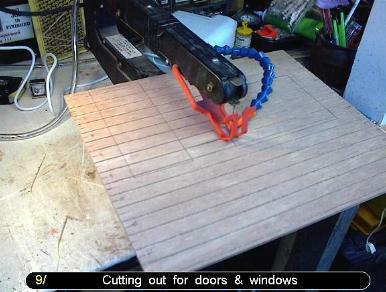 Then I use a scroll saw to cut them out. I have a good Craftsman scroll saw, but this small one was a $5 yard sale find. It just needed a good cleaning and a new blade. I often put wainscot or beadboard in my houses. 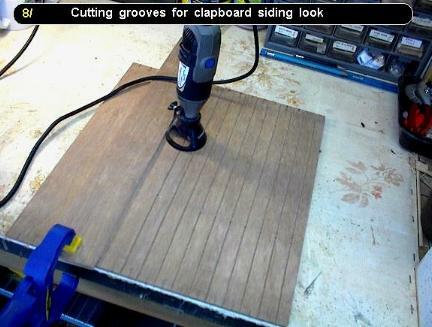 Here I'm using wood splines that were used to connect laminate flooring years ago. Now they have the swift-lock, so they don't use these any more. A contractor friend had several cartons of these that he was going to throw away & I jumped on them! You can also use craft sticks from you craft store. I cut them to 3" an glue them on the walls. Next day a light sanding, stain and finishing. Above this I will wallpaper. The building is starting to come together. The ceiling and roof are set on and I'm checking placement of furniture. Notice that the roof and ceiling are held up with ½" square wood that is glued to the walls. 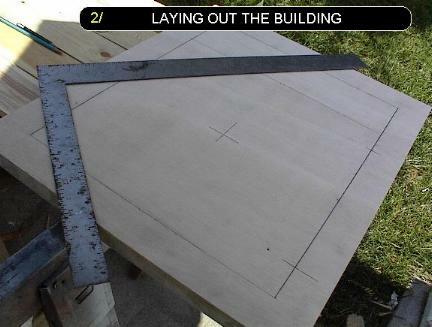 You can cut or sand these square pieces to make them look like crown molding. I wanted the look of a tin ceiling. I glued on some of those splines to give it a textured look and then some aluminum spray paint. I also sprayed on a stenciled border. I drilled holes and mounted a string of 10 clear battery operated lights so that they poke through into the room. These can be expensive to buy, but every Christmas I see them at the Dollar Store for a buck or two, so I stock up. I hold the wires in place with the handyman's secret weapon... duct tape! Finishing up. I painted the building with paint that I had left over from a home job. The lettering is vinyl stick on letters. 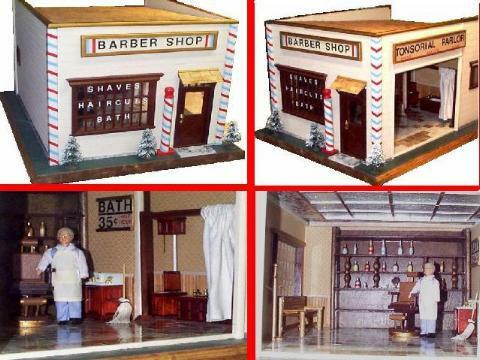 For the stripes on the barber pole & corners... I painted them white & then went to my local grocery store - this is the tape they use to close the bags of fresh vegetables! I asked the manager if I could buy some and he just went in the back and gave me a handful of small rolls in different colors. The floor is down and the furniture is made. Now just the small stuff... curtains, etc. 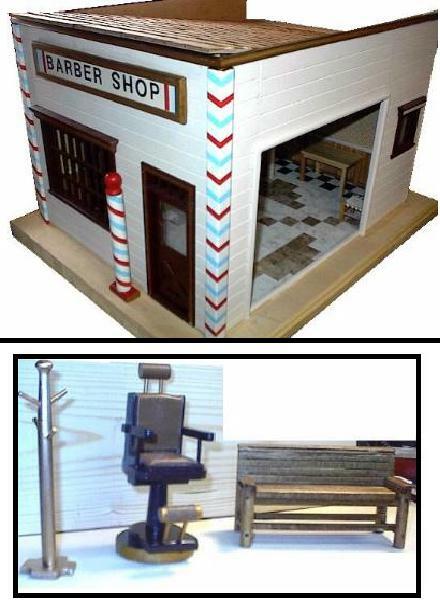 So... that's how I made my barbershop from scratch. I have made a dozen houses this way. Each one I build, I learn something new or find an easier way to do something. 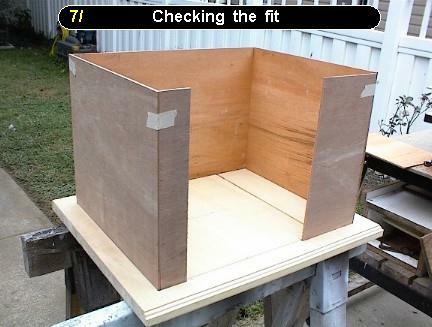 Note on woods: Many people prefer a wood like Baltic birch plywood (sometimes called crafts grade plywood) for building dollhouses. Birch has a tight grain and is finished on both sides. It can be pricey, though - a 4x8-foot sheet of Baltic could run $50 or more. Luan is only about $10-$12 for a 4x8-foot sheet. It is only finished on one side, but since we usually paint or paper the inside... who cares. 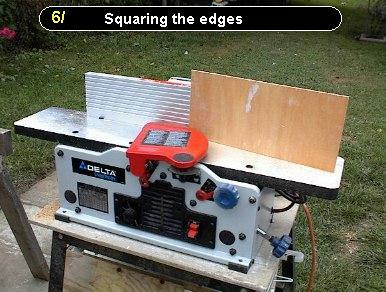 It is light but strong, easy to work with, and does not overtax power tools like some manufactured materials can do. It can be prone to splintering when cut; be sure to have a sharp, fine blade such as the 100-tooth blade in the Dremel table saw. Let the blade do the cutting... do not push or force the material through the saw. This will cause splintering. I would say that if you are going to do a museum quality house, use the Baltic. Us poor folks are happy with luan! 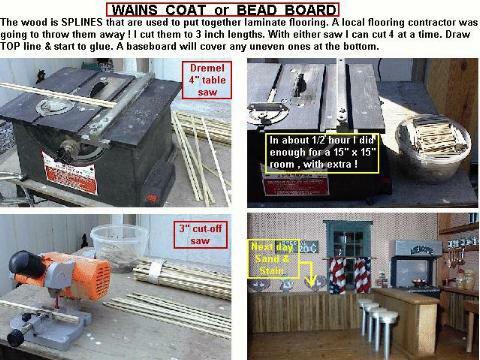 I hope this helps you on your next building project. Cool! !Well done! !Wanna also try this.